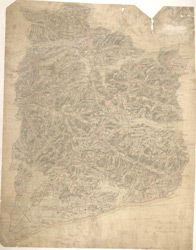 Produced against the background of the Napoleonic Wars, these Ordnance Survey drawings exhibit a hightened interest in defence, particularly along the vulnerable south coast. Military barracks are recorded at Hastings, 'Bopeep' and Bexhill. A faded aquamarine wash defines the coastline from Pevensey Bay to Hastings, with red circles indicating observation stations used to plot the distinctive features of the land being surveyed. Inland, agricultural land (delineated by field boundaries) and woodland dominate the landscape.